Gunnevera at Pimlico. Photo by The Racing Biz. Highlighted by the 143rd running of the Preakness Stakes (G1), the Middle Jewel of the Triple Crown, legendary Pimlico Race Course will offer 15 stakes worth $3.7 million in purses during its spring meet which opens Thursday, May 10. The 12-day stand will run Thursdays through Sundays with the exception of Sunday, May 20. There will be a special Memorial Day program to close the meet on Monday, May 28. 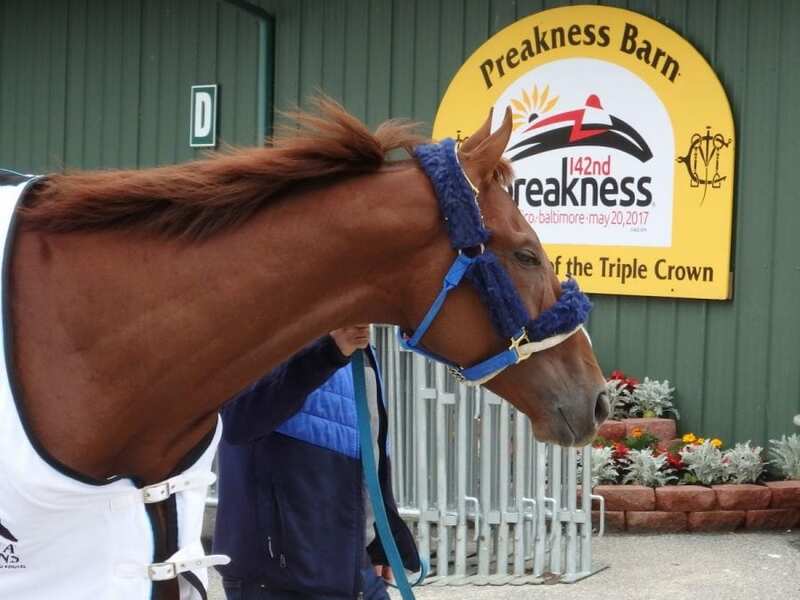 The Preakness will be one of eight stakes, four graded, on a Saturday, May 19 card that includes the $250,000 Dixie (G2), $150,000 Maryland Sprint (G3) and $150,000 Gallorette. Other stakes for 3-year-olds on the day are the $200,000 Chick Lang at six furlongs and the $100,000 LARC Sir Barton at 1 1/16 miles. Preakness eve, May 18, will feature the 94th running of the $250,000 Black-Eyed Susan (G2) for 3-year-old fillies. It highlights a program of seven stakes, four graded, including the $300,000 Pimlico Special (G3), $150,000 Adena Springs Miss Preakness (G3) and $150,000 Allaire DuPont Distaff (G3). The $100,000 Skipat for fillies and mares 3 and up at six furlongs and the $100,000 Jim McKay Turf Sprint for 3-year-olds and up at five furlongs on the grass, both May 18, along with the Maryland Sprint and $100,000 The Very One for fillies and mares 3 and older at five furlongs on the turf will kick off the newly re-established Mid-Atlantic Thoroughbred Championship (MATCH) Racing Series. The MATCH series, which debuted in 1997 and ran for five years, will be contested throughout the summer at Pimlico, Laurel Park, Delaware Park, Monmouth Park, Parx, Penn National and Presque Isle Downs, combining multiple stakes worth $2.9 million in purses with bonuses for participating owners and trainers both for overall points accumulated and in each of five age/surface divisions. Preakness Week at Pimlico includes several special events including Sunrise at Old Hilltop, the Alibi Breakfast, the Ultimate Girls Day Out and InfieldFest, one of the country’s most eclectic outdoor music festivals.